This week, AMPed, Podcrawl, funnies and seriousness, and a very eclectic mix of 8 great tracks. Association of Music Podcasting – check out the new website! 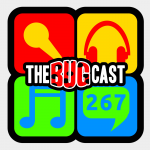 The next show will be episode 268, which will be broadcast live in the chatroom on Friday 28 June 2013 from 21:30 UK time (UTC+0100).